I don´t use a haversack but a mussete bag. Now I have a pouch for my meat can and my cutlery. This meat can pouch was unissued and perfect condition. I am very pleased with it. Thanks! Pretty nice- just a bit of minor rust on the back. A bit of Oxidation, some minor spoiling on weak points, all imputable to age, otherwise perfect & unissued just right as stated; I can't say Looking Minty nor Brand New like other more lucky reviewers report, but I'm happy the same. 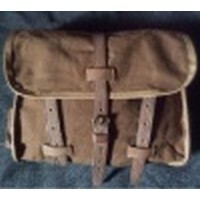 I've got yet a complete one & I wanted another one to "sacrifice", hard to find -I really don't know why- a repro sold separated from the haversack & I'm satisfied both from the conditions & the price. I would rather recommend to collectors. I'm thrilled with this item. It really does look brand new and matches my haversack perfectly. Really worth the price! Brand new original. Can't get better. They do look minty for being orignal. Very fast shipping. A very nice service and communication!!! Awesome. Don't know how it could get any better than this. Fits Right In With My Work, Color Right On. NICE ITEM. Item arrived in perfectly MINT condition, never used. As described. None better!! !